Discussion in 'Archive' started by CM Fragola, Jun 6, 2017. Today the popular brooch gets a new look! 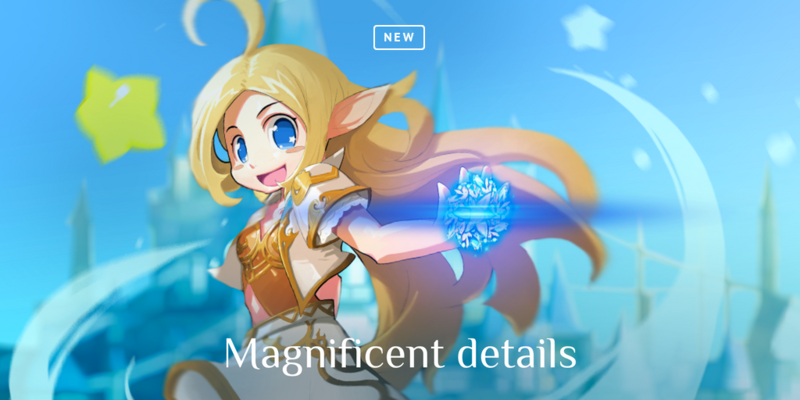 You will be able to obtain new La Vie En Rose's Magnificent Brooch and augment it with special Brooch Spirit Stones to receive even more bonuses for your character! As usual Merchant of Mammon will give you an opportunity to obtain Brooch Spirit Stone in the game! 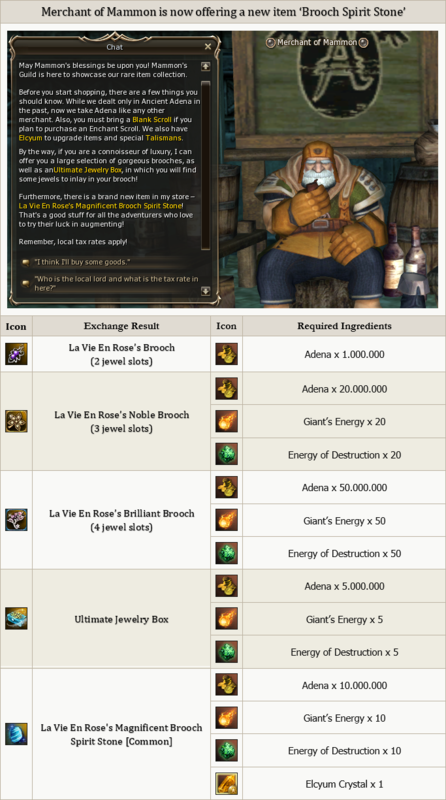 Legendary Blacksmith Shadai also got an update: if you have 4-slot Brilliant brooch, you will be able to exchange it to 5-slot Radiant Brooch! 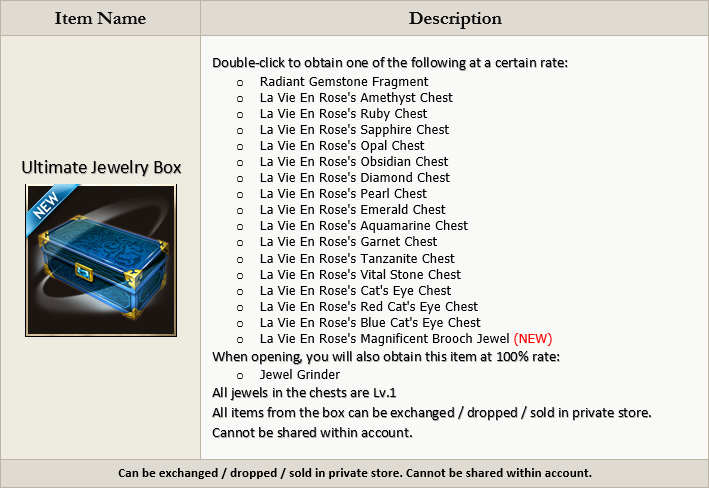 So, meet new item in L2 Store – La Vie En Rose's Magnificent Brooch Spirit Stone. 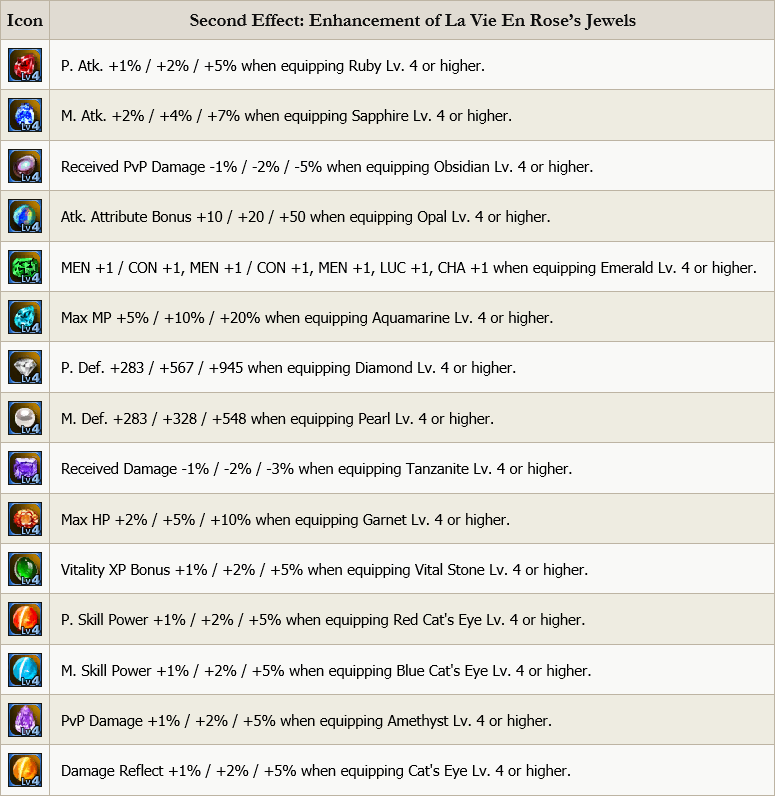 You can use it to augment new La Vie En Rose's Magnificent Brooch. Merchant of Mammon also has this stone in stock. Now, let's look at the new brooch. June 6 will bring an update with a new – Magnificent Brooch. It can be of two kinds: Enhanced and Rare. Both brooches activate 6 slots for jewels. Rare kind also boosts all basic stats by 2 and gives Max CP +12%. New brooches can be exchanged, dropped, sold in private store. But as soon as you augment your brooch, it is bound to the character and is no longer tradable. Both brooches can be augmented with Magnificent Brooch Spirit Stones. Enhanced Brooch requires common Spirit Stone, Rare Brooch requires Rare Spirit Stone (it has a yellow frame on the icon). Magnificent Brooch (both types) is the only brooch you can augment. Old brooches cannot be augmented. Augmenting a brooch is as easy as augmenting a weapon or an armor. 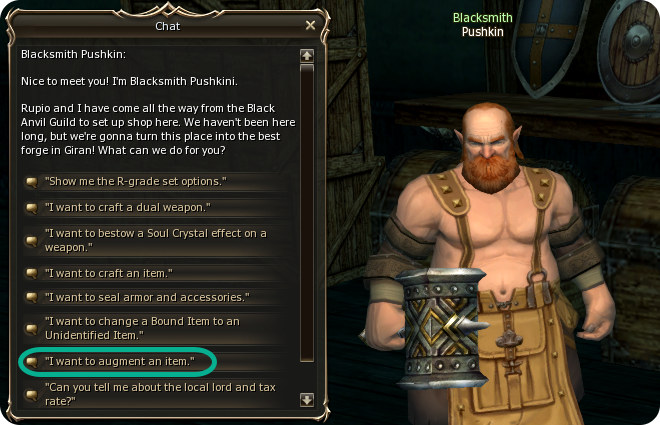 Find a Blacksmith in any town and choose "I want to augment an item". Enhanced Brooch and rare Brooch give different augmentation options. Enhanced only gives usual stats boost. If you augment an Enhanced Brooch, you get 2 random effects. 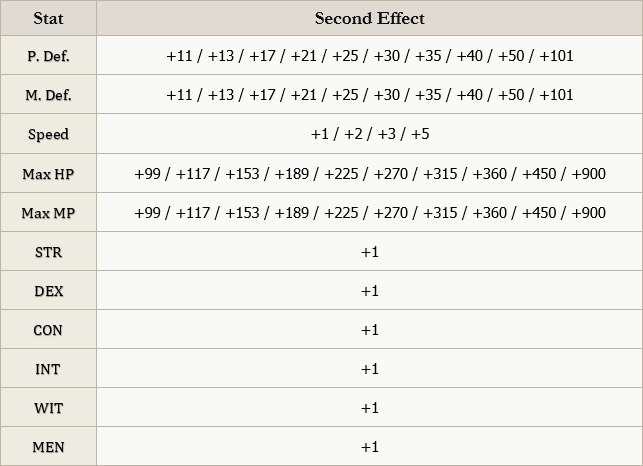 There's a chance that you will get 2 effects of the same kind, for example, P. Def. +11 and P. Def. +40. Augmenting a Rare Brooch also gives you 2 effects, one is from the list of stats, the second is unique to Rare Brooch - it gives an additional bonus to an equipped Jewel Lv. 4 or higher! 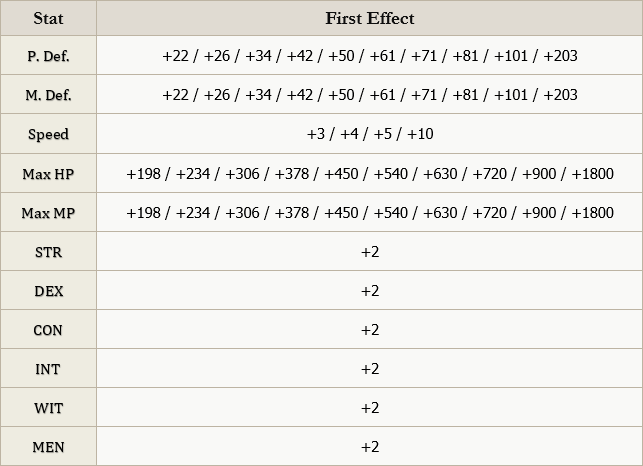 Please note, that second effect has 3 levels, you will get one of them with augmentation, for example, Ruby +1% or Ruby +2% or Ruby +5%, it depends on your luck..
* Rare Brooch augmentation effect gives the boost to only 1 of equipped jewels, even if you equip several of the same kind. 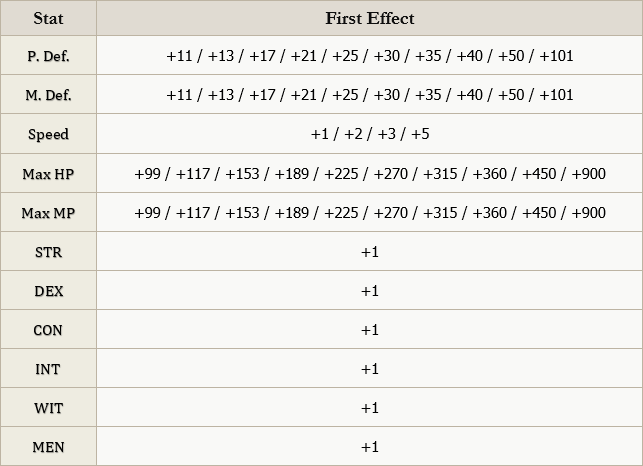 ** All jewel boost effects are random. It means, that if you got Ruby effect and you don't have the Ruby itself, you can either change the augmentation effect or buy and equip a Ruby to get the bonus. 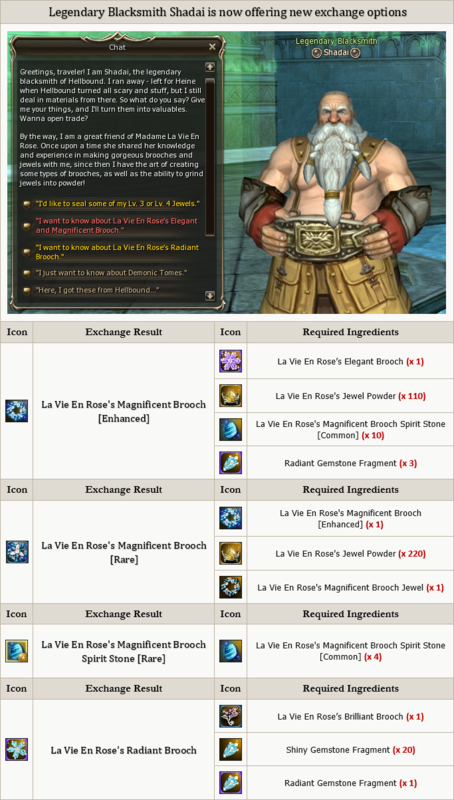 Legendary Blacksmith Shadai now offers new exchange options and he can also exchange usual Brooch Spirit Stone to a Rare kind. Also, now 4-slot Brilliant Brooch owners can exchange it to 5-slot Radiant Brooch! * All the existing Shadai's exchange options (except the making of Radiant Brooch) were not changed. 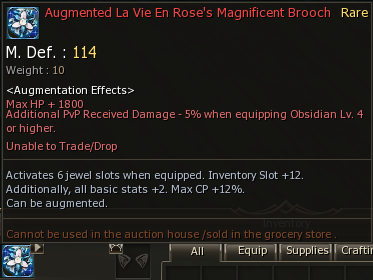 ** When upgrading the Enhanced Magnificent Brooch to a Rare one, augmentation effects are not removed. A key material for making a Rare Magnificent Brooch is a La Vie En Rose's Magnificent Brooch Jewel. It can be obtained at a low rate from Ultimate Jewelry Box. As usual, we're adding new L2 Store items to the stock of Merchant of Mammon, so any player could obtain them in the game. Brand new La Vie En Rose's Magnificent Brooch Spirit Stone [Common] has been added to the sales list of Merchant of Mammon. La Vie En Rose's Radiant Brooch Chest in the Ultimate Jewelry Box has been replaced with a new La Vie En Rose's Magnificent Brooch Jewel. The chance of obtaining the new item is lower though. We have prepared a summary table on all the types of brooches to make it easier to navigate. Check this out!